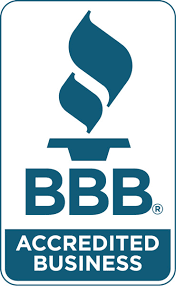 We are Licensed, Certified Installers of Fortress Stabilization Systems. 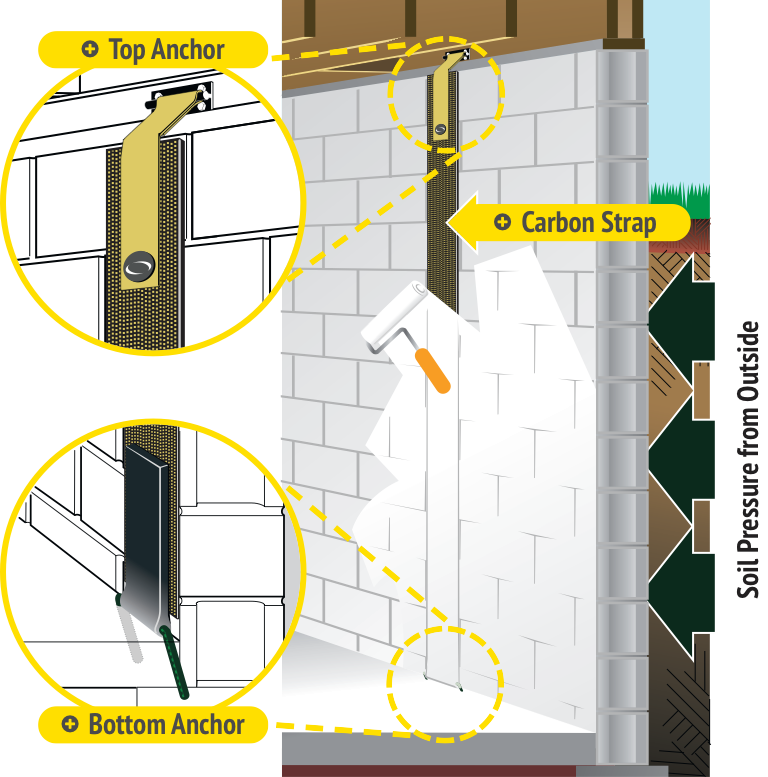 Grip-Tite Foundation Anchors are for basements that have bowed, cracked or leaning walls. Typically, these types of failures are due to hydrostatic pressure from too much water combined with the weight of expanding soil pushing inward thus causing the failure that produces the bowing, cracking or leaning foundation. Living in Chicago and the surrounding suburbs like Glen Ellyn, Wheaton, Northbrook, Deerfield or in Tinley Park, Palos Hills, Orland Park, and all other cities and towns, exposes our homes to all types of weather conditions that make Grip-Tite Foundation Anchors a necessity. We have dry hot summer days that make the soil contract followed by summer storms that dump massive amounts of water in very short periods of time that will expand the soil at rapid rate which puts a tremendous amount of stress on the homes foundation. water to the already heavy clay. Now take a look at your front yard, your back yard and the proximity of your neighbors. All the land surrounding your foundation contains hundreds of thousands of gallons of water that is pushing up against your foundation. The deeper the foundation, the more pressure created. That is why foundations crack, bow and lean and Grip-Tite Foundation Anchors are a great solution. and begin to bow. 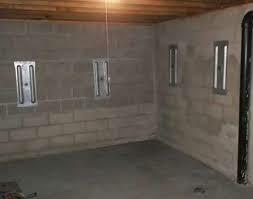 Cinder block foundations are most susceptible to damage. 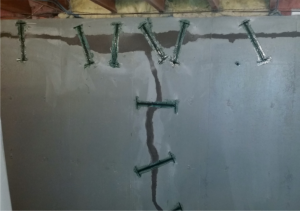 If Grip-Tite Foundation Anchors are installed early, the damage can be minimized and stopped in its track. You can rely upon Grip-Tite Wall Anchors. 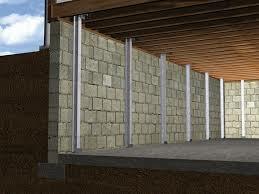 We are trained and licensed Grip-Tite Foundation Wall Anchor Installers and know how to stop further damage. Grip-Tite Foundation Wall Anchors are awesome but some foundations need a different yet effective solution other than Grip-Tite Foundation Wall Anchors. The Fortress Foundation Stabilization System is Patent Protected. This is important because you cannot find a better product or system that is the same as Fortress Carbon Kevlar Fiber. Carbon Fiber interwoven with Kevlar is the right way to stabilize specific foundation issues. Not all carbon fiber straps are created equal. Before taking into consideration a different carbon fiber system, due diligence will have you asking how their fibers are arranged. Usually manufactures weave the carbon. This process produces an good-looking woven pattern, but this process also crimps the fibers as they go over and underneath each other making them weaker by reducing the strength of the fiber. Fortress Carbon Kevlar Straps utilizes unidirectional weave which allows the composite fibers to lay flat, eliminating flex when force is applied. Fortress Carbon Kevlar Straps lay flat throughout the manufacturing process which allows Fortress Carbon Kevlar Straps retain the strength and performance needed to last a lifetime. The unidirectional method Fortress uses to produce the Fortress Carbon Kevlar Straps is a proprietary manufacturing process. A second step for a stronger bond. 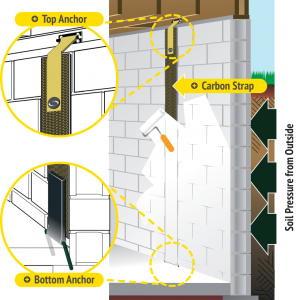 Fortress Carbon Fiber Straps 2-Step-Strong epoxy adhering process guarantees that a ultimate strength bond to concrete and masonry is created. Fortress’ bond is so strong that the surface of the concrete or block will fail before the bond fails. Contrasting of other systems’ where their strap is simply pressed and rolled into an adhesive, Fortress goes further. After the Fortress strap is hard-pressed into position, a band of specially designed, clear Mylar is positioned over the strap. This second step of pressing and rolling the Mylar into the epoxy over the Carbon-Kevlar Foundation Strap forces the epoxy into and around each carbon fiber group. This produces a vacuum under the Mylar so air and voids are eliminated. This gives us visual verification that all air bubbles and voids are gone. 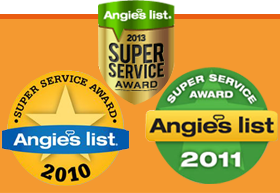 Our process stops excessive humidity and moisture from deteriorating the epoxy curing process. This extra step to verify you get a completely bonded strap separates Fortress Carbon Kevlar Straps from the competition. Steel “I” Beams, Steel Channel are the 2 best choices to support a bowing cinder block foundation wall if steel is the choice for your specific needs. Over the years, I have seen this application misused, improperly installed and the wrong material implemented. 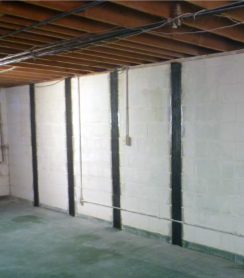 Using Steel to support bowing cinder block foundation can be complicated and this is especially true when a drain tile and wall seepage system needs to be installed in conjunction with a support system for bowing cinder block walls. The system being installed has to be flexible to conform to the existing condition yet strong enough to stop it from moving completely. Design and Installation are critical pieces of the configuration needed to be successful. Safe Seal has the expertise, know how and experience to meet these extraordinary conditions. Selecting the right steel, understanding the condition existing footings (if there is one), size of floor joists, precise placement and a system that can adjust the tension or force applied to the bowing foundation wall all must be considered. 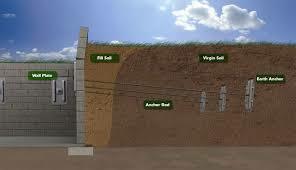 All Foundation Wall Support System should also have a drain tile system install along with a wall seepage system. A properly installed drain tile system will relieve a tremendous amount of pressure being exerted on the wall. Poured concrete foundations can have the same problem. Horizontal cracks are an excellent indicator that the foundation bowing is either an existing problem or soon will be. Any foundation crack that is not flush or that has an obvious edge or subtle edge will prove the foundation is moving. 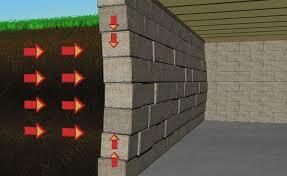 Using a level is a great tool to see if a foundation is moving. Simply, if the level does not lie completely flat on both sides of the crack, the foundation is moving. The picture above is the perfect scenario where we use carbon fiber staples strategically placed to stop the foundation from moving which is critical to also stop a crack from leaking. Carbon fiber staples are awesome when used appropriately. Yet Carbon Fiber Foundation Staples and not a solution for all foundation issues. It takes a professional with know how and expertise on where to use Carbon Fiber Foundation Staples and how to install Carbon Fiber Foundation Staples. Carbon Fiber, one of the strongest materials made. Made to make your foundation last a lot longer. Everything in life is built on a strong foundation.